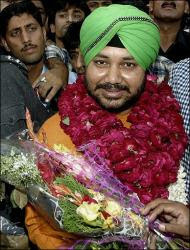 An Indian court formally charged famous bhangra-pop singer Daler Mehndi and his brother in a human trafficking case registered against them in 2003. A Punjabi villager said the two brothers took 450,000 rupees (11,250 dollars) from him and promised to take him abroad posing as a member of the star's dance troupe -- but failed to do so. Daler and his brother Shamsher have been charged with forgery, conspiracy and cheating. The singer was present when the charges were framed. Ahh thanks for the correction, he was just charged not convicted. See the changed title!